Kitchen Remodeling: How Much Does a Kitchen Remodel Cost? There’s no doubt about it — remodeling your kitchen is the most exciting home improvement project you can take on. Between beautiful new countertops, stunning cabinets, and gorgeous details from top to bottom, your new kitchen is almost guaranteed to bring you joy each and every time you see it. We’re as excited as you are to get started. 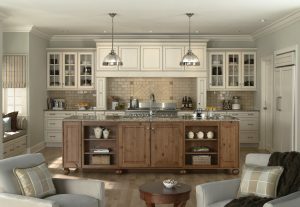 You can begin with a free kitchen remodeling estimate on this page, or you can visit one of our showrooms to meet with a kitchen designer. We currently have showrooms in Twin Falls and Long Island, and we plan to open more locations as the year goes on. Visit a location near you to see all of our kitchen remodeling options, and read on to learn more about the process! If you’re like most homeowners, then the first thing you’re wondering is how much your remodel will cost. As you might expect, there’s no one-size-fits-all amount we can provide, as the total cost of your remodel depends on a wide variety of factors. A simple cabinetry update, for instance, will be significantly less than a start-from-scratch remodel. Even if you have a specific budget in mind, remember that you will only be remodeling your kitchen once. Take this opportunity to purchase everything you truly want! Whether it’s a new backsplash or a certain cabinet style with luxury features, now is the time to create a space that you can cherish for years to come. That being said, our kitchen designers will always work with you to create a stunning kitchen design that doesn’t exceed your budget! While aesthetic appeal is one of the main reasons why homeowners choose to invest in kitchen remodels, reimagining your space will benefit you in several other ways. Your kitchen will be much more functional, for one, and you’ll also benefit from an increase in your home’s resale value. In fact, some of the most recent home remodeling reports show that you can expect to recover up to 80 percent of your initial investment! Even if you don’t plan to sell your home at any point in the near future, knowing that you’ll recoup a substantial portion of your investment will only add to your enthusiasm. Get a Free Kitchen Remodeling Estimate Today! We hope that today’s entry will inspire you to invest in the kitchen you’ve always wanted. Stay tuned for future posts where we’ll continue to provide you with even more information about kitchen remodeling! Are you ready to get to work? We have several different ways for you to get started from the comfort of your own home! You can visit this page to request an estimate, or you can start designing your new kitchen through this page. One of our kitchen designers will reach out to you shortly to provide you with your next steps. Would you like in-person support with the remodeling process? Visit a Kiba showroom to meet with our friendly kitchen designers. Every kitchen tells a story. Start telling yours today!